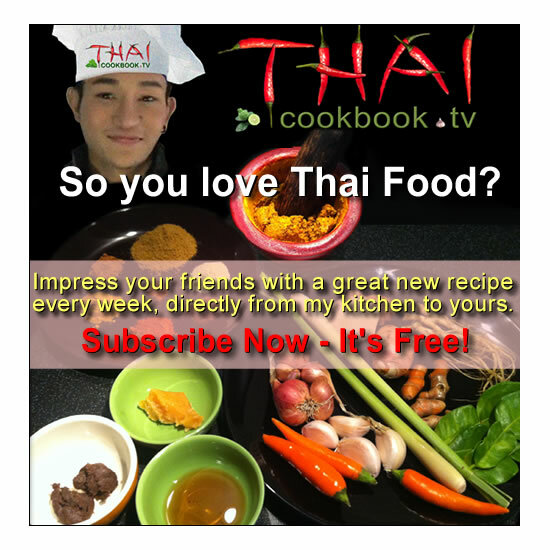 This amazing Thai salad, known as Pah Talay, is made with fresh shrimp and squid that has been marinated in lime juice, then blanched for just a bit in boiling water. 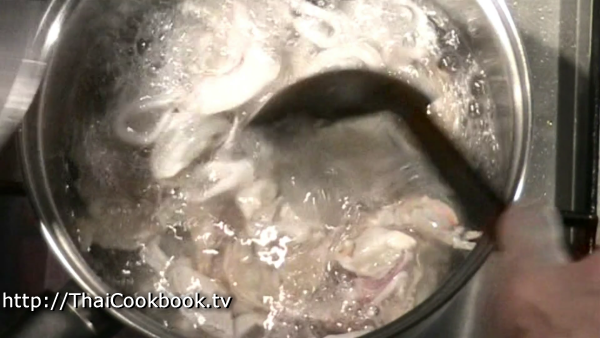 The result are squid rings that are soft and delicious, and shrimp that are plump and juicy. We toss these together with lots of sliced onion, shallots, lemongrass, green onion, garlic, mint, and cilantro. The base for the salad dressing is Nam Prik Pao, our chili sauce that's made with fire-roasted ingredients and is bursting with rich, earthy, smokey, and sweet flavors. This is not your grandma's seafood salad, and you simply must give it a try. 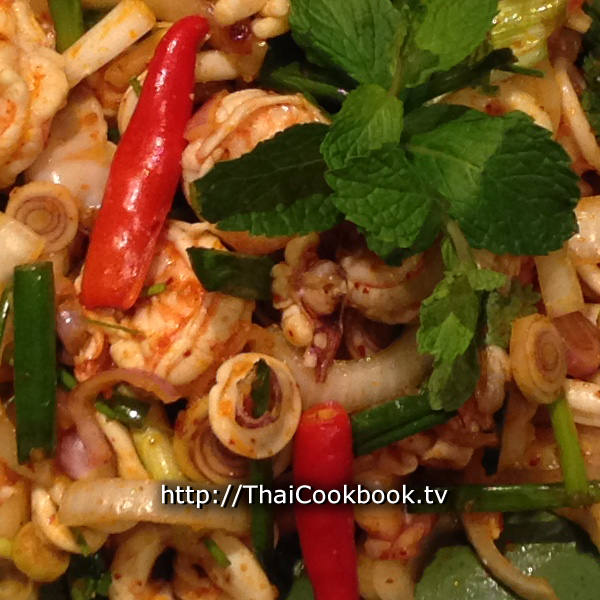 What's in our Spicy Seafood Salad. How we make our Spicy Seafood Salad. 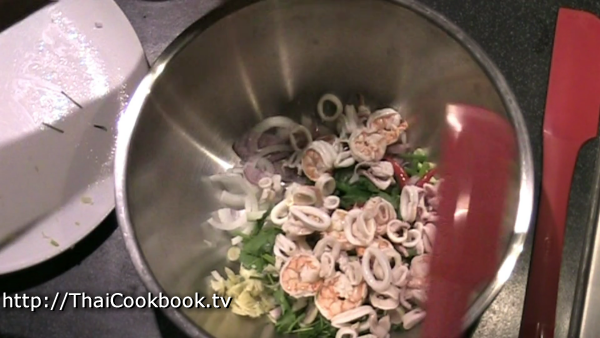 1) Clean the shrimp and squid well, then blanch it in boiling water for 30 seconds. 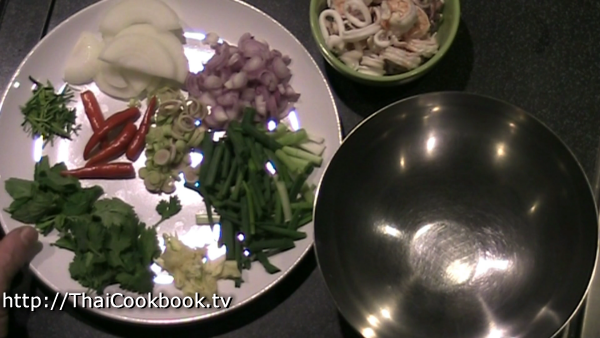 2) Chop and slice the fresh ingredients. 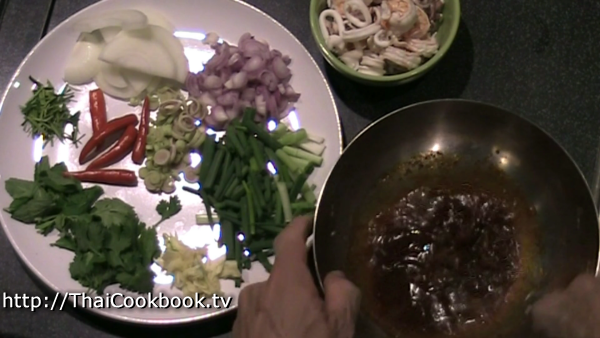 3) Blend the fish sauce, lime juice, sugar, and nam prik pao to make the salad dressing. 4) Toss everything together and serve. Clean and devein the shrimp. Wash the squid bodies out very well, then slice them into 1/2 inch rings. 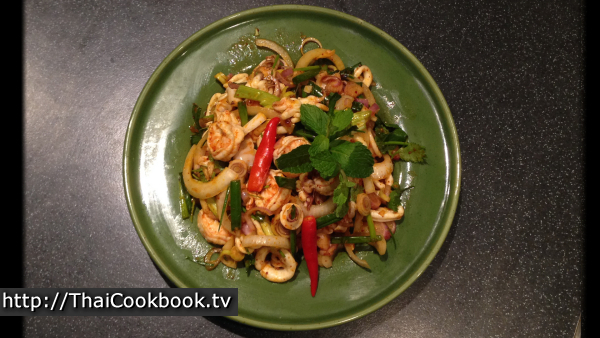 Marinate the clean squid and shrimp together in about 1 tablespoon of fresh lime juice, for about 15 minutes. Boil 4 cups of water. Add the squid and shrimp the hot water and stir around for about 30 seconds or so. 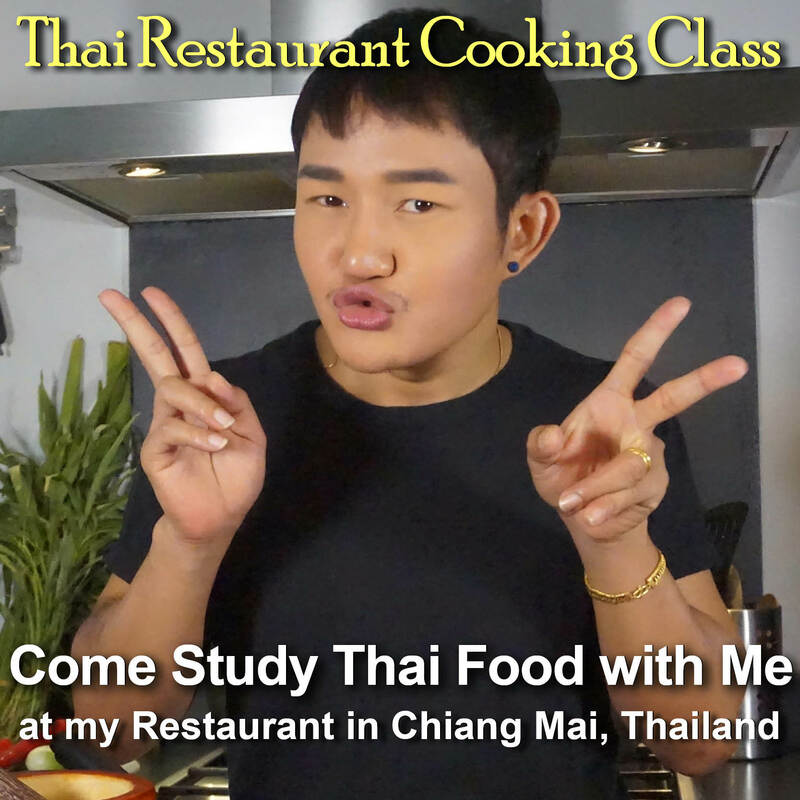 You just want to quickly blanch the seafood, just until it is barely done, so as soon as the shrimp are pink remove it all from the hot water and rinse well in very cold water to stop it from cooking too long. Now, prepare the fresh ingredients. Slice half an onion in nice thick slices. Slice the shallots and lemongrass very thin. Chop the garlic very fine. Remove the big stems from the mint and cilantro so you have just whole leaves. Cut the green onion into 1 inch pieces. Hit the red hot chilies just a little using a knife handle or your pestle to break them open and release the hot flavor. Slice the kaffir lime leaves into very thin slivers. In a small bowl, whisk together the fish sauce, lime juice, sugar, and roasted chili sauce. Put all the fresh ingredients, except the sliced kaffir lime leaves, together with the blanched seafood into a large bowl so you have room to toss it up well. Add the dressing and toss everything until it is well coated. Serve on one plate to be shared at the table. Garnish by sprinkling the kaffir lime leaf slivers and placing some fresh mint leaves over the top.